Great quality club! Relatively weighty club that will get under the ball quickly and deliver high trajectory. Great club for anyone who wants consistency and the ability to try the big shots when necessary. Absolute smart buy! May be a little difficult to work fades and draws but power is NOT limited! No negatives, all round excellent club. These irons felt smooth through ball. They hit 6-9 high in air. The 3-5 went low trajectory, but club length farther than my last set. I would recommend these irons to anyone. Got my OS RAC irons second hand. The fill when hitting the ball is just great.I have had them one month and have dropped from 24.4 down to 20.6. very pleased. Have had wide grips fitted which as also helped. I have owned this set since 2009 and appreciate the quality and durability as well as the consistency delivered on well struck balls. There is nothing worse than pulling out your 9 iron and hitting it on the sweet spot and seeing it fly 20 yards over the target. This never happens with this. Very consistent shots 3-pw. Had a friend getting ready to spend 379 on a new set of rocket ballz irons and after testing mine out decided to save a few hundred bucks because he couldn't notice any difference. I bought this set new in 2006. It was my first "nice" set of irons I have ever bought, certainly my first new set. My first round, I was ecstatic to play with them. Having to travel a lot for work, I took my clubs with me a few times. After roughly 50 rounds of golf, several shafts near the head are beginning to fray near the heads. I have tried to work with Taylor Made to help correct the issue but was basically told I am up a creek without a paddle and they will not help. Some of you may be able to relate to this. 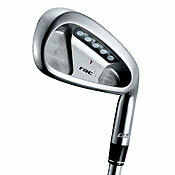 I've been on a frustrating search for a few years for the perfect irons that would compliment my ability. Today I struck gold with the taylormade rac irons! I shoot in the 90's so blades weren't a a good option however I still wanted a balance of power, feel and forgiveness. Have been using these irons ever since 2004 and my handicap went from 32 to 18. Nice irons, great length and good feeling. Changed this year (2013) to new players irons and have to wait what these will bring. Sick clubs, I've had the taylormade rac OS for a few years now and they never disapoint. Constant precision on the green, nice distancee, recommended to all. Nice ball contact and good face, allows a bit of forgiveness.